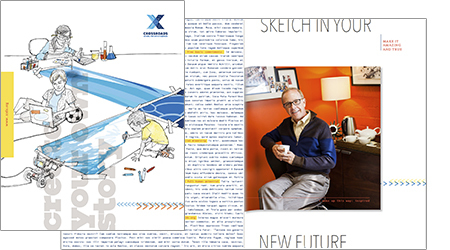 The Viewbook for Crossroads School for Arts & Sciences, Sketch Your Own Story, is both a student recruiting and an institutional marketing piece. The goal: capture the essence of essence this exceptional (read: quirky, creative) independent day school in Santa Monica, California. It was a tall order. A collaborative team set out to: 1) create a Viewbook that looks like no one else's, 2) make the book an interactive piece, and 3) capture the extraordinary energy of the school. Led by Art Director Linda Warren of Warren Group | Studio Deluxe, we achieved all three objectives. The Viewbook content evolved organically, with creative input from each team member. We kept layering in more stories, more information, in sometimes surprising ways. The piece invites, even insists, on multiple readings — always important when competing for an audience's attention.